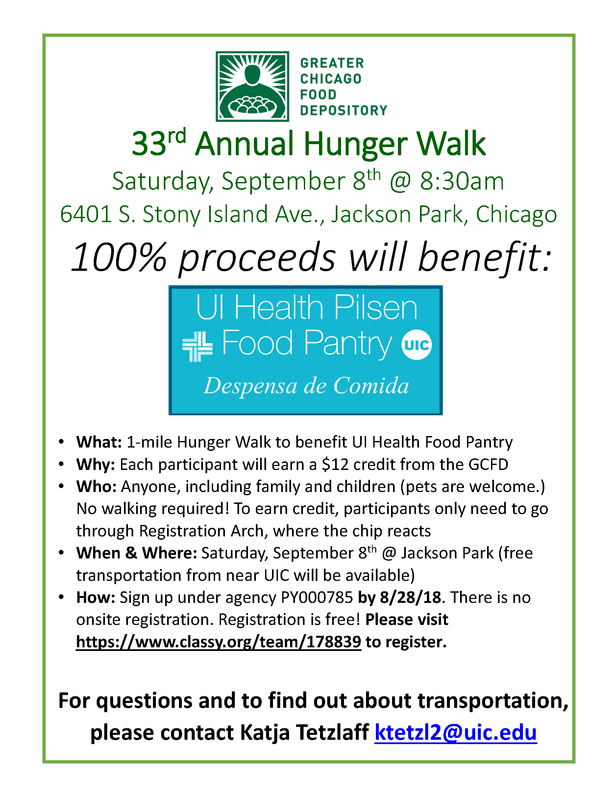 Support UI Health Pilsen Food Pantry @ 33rd Annual HUNGER WALK! Benefit the UI Health Pilsen Food Pantry by joining the College of Applied Health Science’s team participating in the 33rd annual Greater Chicago Food Depository’s 1-mile HUNGER WALK ! The goal of our participation is to raise funds and awareness for hunger-fighting programs in Cook County and 100% of proceeds raised by our team will go directly to the UI Health Pilsen Food Pantry. The event will begin at 8:30am on Saturday, September 8th in Jackson Park; transportation from the Pantry at 1713 S. Ashland will be provided. All are welcome to join, including family and children (pets are welcome but do not count as participants.) And no walking is required! Participants need only go through/stand under the Registration Arch, where the chip reacts, to earn credit. Registration is easy and free! However, there is no onsite registration so please visit https://www.classy.org/team/178839 to register yourself and others no later than 8/28/2018. Please see the attached flyer for additional information and feel free to share. If you are able to participate, please let me know via email so that I can be in touch with additional details.